This is the question most commonly asked by new homeowners as they begin to research numerous furnishing options. It can be a tough choice when picking out the best material for your new kitchen or bathroom, but that’s why K&J’s Custom Granite in Edmonton, is ready to help. 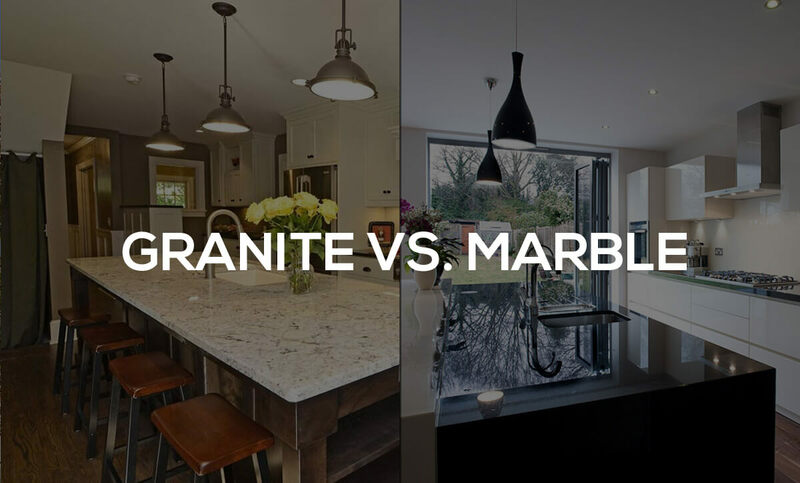 In this blog post we’re going to help you determine whether marble or granite countertops are the best choice for your home. Both granite and marble are pristine pieces of stone that come from the earth and can really make your house stand out from the rest. The lustrous shine that each provides is hard to ignore. However, both of these natural stones offer different looks depending on the aesthetic effects that you desire. Marble is a metamorphic stone, which is formed when sediment crystallizes under extreme heat and pressure to form hard rock. Marble, however, is actually softer than other stones. Its porousness makes it more susceptible to staining, discoloration, and scratches. This makes it less ideal for kitchen countertops and a better option for less trafficked areas of the house. But, don’t let this scare you away! Although marble takes a bit more maintenance, when done correctly, it really pays off. Our professionals at K&J’s Custom Granite will simply apply a sealant at the beginning of installation keeping your marble in mint condition. In addition, all countertop installations in Edmonton come with complimentary lifetime chip repair! No two slabs are alike—marble comes in a large array of hues, such as solid white, solid black and a of variety colors in the rose, yellow, gray, green, white and black spectrums. Its versatility cannot be denied as it looks perfect on everything from fireplace surrounds to walls, flooring and bathrooms. Marble is one of the most elegant and luxurious looking stones and will last for generations with the right care. Granite originates from molten lava and is much more durable than marble. This igneous stone comes in a large range of patterns from similar grains to multicolored and is made up of a mixture of quartz, feldspars, and other minerals. Unlike marble, granite is much stronger and resistant to abrasions, discoloration, and staining. These qualities make it an excellent choice for higher traffic areas including kitchen countertops, bar tops, and dining tables. Granite has been used for centuries—its classic look can spruce up any kitchen and its strength and durability will immediately add value to your home. With a range of distinguished looks, your new set of granite will be appreciated anywhere from a modern high rise to a country style farmhouse. So what’s the verdict? What is the best countertop choice for your home? Both granite and marble can be used in numerous ways but location and use will be the deciding factor. Granite is more commonly seen in kitchens and other high traffic areas due to its durability and resistance to staining and abrasions. Marble is a softer stone that will look great in a bathroom, fireplace, or other low traffic area of your home. Whatever you decide, K&J’s Custom Granite can assure you that granite and marble are beautiful and stylish stones that will give your home the high-end feel you’ve been looking for. Whether it’s the dining room, kitchen, or bathroom, installing granite or marble will increase the elegance, luxury, and class of your home.